Good gosh, we’re this close to BarCampMilwaukee3! The whole thing goes down October 4th/5th, 2008 in Milwaukee, Wisconsin at Bucketworks. There’s also a Friday night pre-BarCamp party event being planned that we need to spread the word about. Details should be available soon. 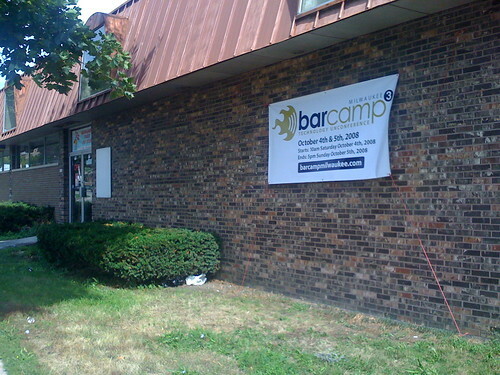 This is our 3rd BarCamp in Milwaukee (hence the “BarCampMilwaukee3″ title!) and it feels like we’re in the groove of getting these things up and running. This year seems so much more mellow than last year. I’ve been keeping an eye on registration, and I’ve seen some interesting people sign up. As of writing this we’re at well over 100 people, and I’m guessing we’ll see that shoot up in the next week, and get more people who didn’t even sign up attending. Remember to check out the proposed sessions to see what people are interested in doing. I’m pretty excited about the Hobby Robotics Make’n’Take Session and of course the The Future of Microblogging session looks amazing! 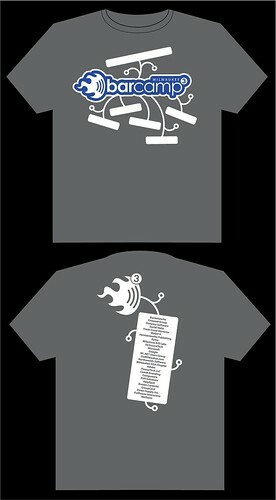 And have you see the shirt Mike Rohde designed? It incorporates tagging! How sweet is that? So join us! It’s not too late to sign up… head over to barcampmilwaukee.org and use the signup wizard to register… We hope to see you there.